In June of 2015 Renske Horn (designer and illustrator) drew Haarlem City Hall and posted her illustration on social media. Many enthusiastic reactions followed. People started making request for different buildings they would love to see as an illustrations. Renske soon started working on the Vleeshal and the Grote of Sint Bavo church. Within a few weeks there was the start of a small series of illustrations. Soon the question followed: “where can we buy these?” With minimum means Renske made a small webshop to sell prints. It was the official start of Haarlemse Huisjes. 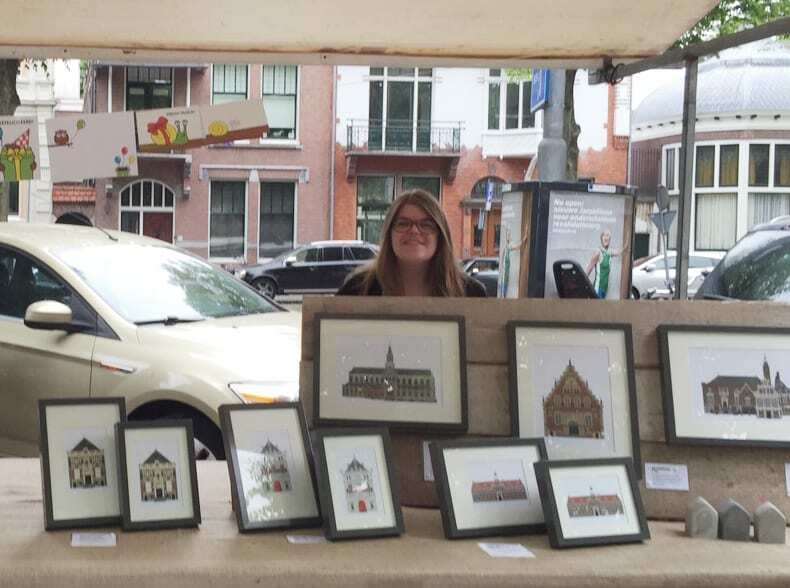 A year later, in June 2016 Renske took part in a market for the first time. She sold prints and framed pictures of the Haarlemse Huisjes. The market was a perfect way to let people know about the webshop. On social media the audience grew and with that, the webshop got busier. Because there was some money coming in, Renske could order cards and envelopes to fill the webshop. In 2016 Renske also developed the Haarlem keychain. 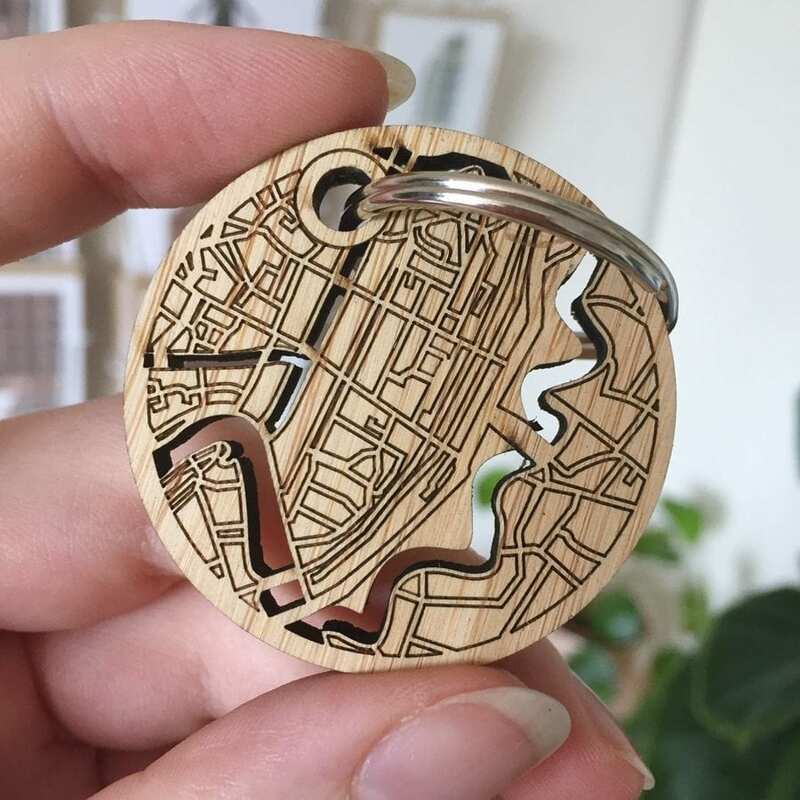 An illustration of the city map of Haarlem, engraved and cut into bamboo wood using a laser cutting machine. A perfect souvenir and a way to always carry Haarlem with you. This year Haarlemse Huisjes also took part in the Stripdagen (Comic book festival) and the Christmas Market in Haarlem. The year start of very good with a wonderful article in the local paper (it’s in dutch, but you can find it here). The good publicity works like a charm and the orders came flooding in. Also, lots of people buy a limited edition illustration of their own home. 2017 Is a year full of new products and illustrations. The webshop grows larger and larger and is now filled with posters, cards, keychains, magnets and even mugs. Right before the Christmas market the Haarlem Birthday Calendar is introduced. In 2017 Eva, Melanie, Edwin, Max and Renske work on a project together. They liked working together so much, they decided to continue the collaboration and started working on the Hollandse Huisjes. Now that there are five people working on design, copyright, social media and the webshop, there is more room for developing new products and illustrations. In the meantime, we even have our own laser cutting machine. 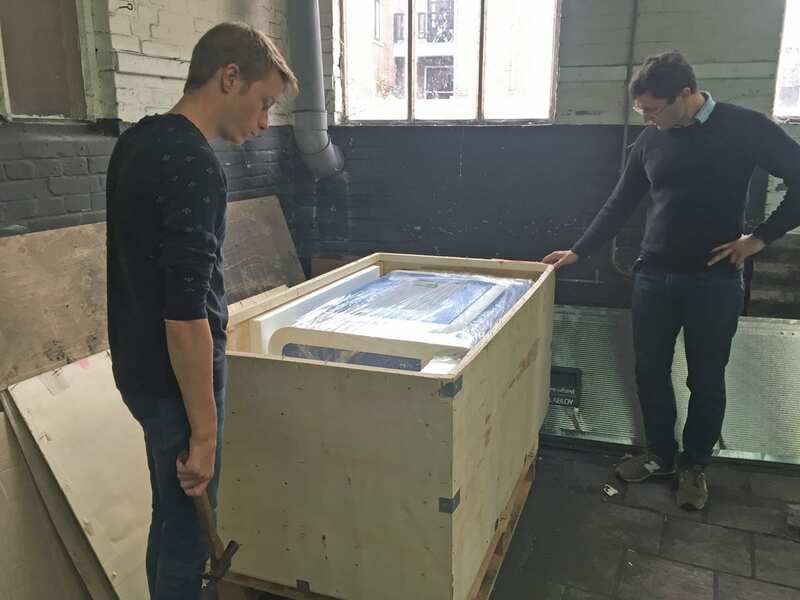 Thanks to this amazing machine we have loads of possibilities to experiment with new materials and products. We can also develop more customisable products.